After mentioning I baked a vegan cake last month I got asked for the recipe. I didn't cut it at the time of baking as it was put in the freezer (another plus point!) for a later bake sale. 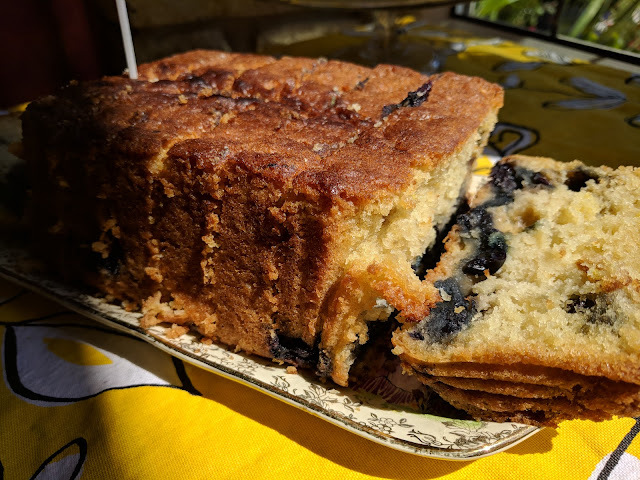 Well, that bake sale was this weekend so here the cut version with all the juicy blueberries oozing out of it. I have often found that cakes that cut out eggs and /or dairy fat don't puff up as well and aren't very light in texture. The secret to this one looking and tasting so good is that it has soya milk in it which reacts with the bicarbonate of soda to get a good rise. The dairy fat is replaced by sunflower oil and whole mix I put together like you would when making muffins. In a bowl add the flour, sugar, bicarbonate of soda and baking powder and mix together. Make a well in the centre and pour in the milk, oil, lemon zest and juice, vanilla extract and blueberries. Mix together quickly until just combined (lie you would with a muffin mix). Transfer the mixture to the prepared tin and level out the top. Bake for around 30-35 minutes until a skewer comes out clean (look out for the blueberries). Take out of the oven and leave to cool in the tin for 10 minutes before turning out onto a wire rack to cool. That looks amazing, it really has risen well and it looks so moist and inviting.